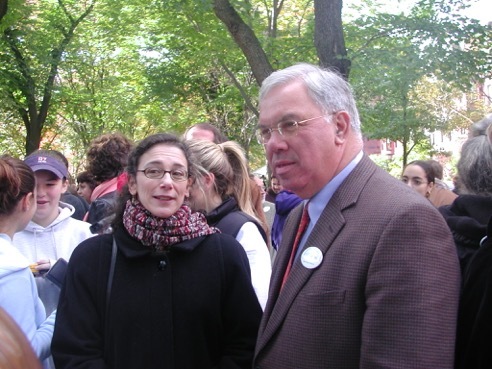 Mayor Menino and his wife Angela were champions of the women and children of Boston. The mayor valued the city’s partnership with the Boston Women’s Heritage Trail, especially its work in the Boston Public Schools. Over the years, the mayor supported the Trail in ways both large and small. 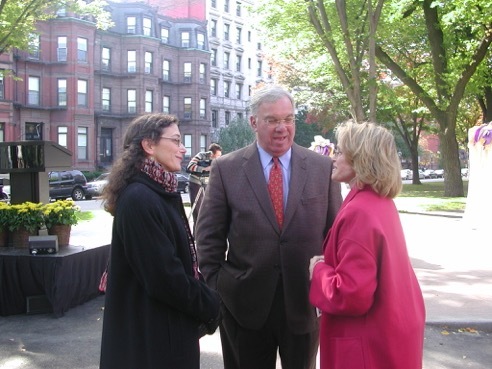 The Boston Women’s Heritage Trail partnered with Mayor Menino and other organizations to create The Boston Women’s Memorial, the first memorial to women on the Commonwealth Avenue Mall. When Mayor Menino found out how little was being recommended by the Edward Ingersoll Browne Fund for the Memorial, he increased the funding substantially. The Mayor recognized how important it was to fund art representing women in Boston’s history. The Trail is grateful for the mayor’s support and we will miss him. Here Mayor Menino talks with sculptor Meredith Bergmann (left) and inaugural funder Barbara Lee (right) at the dedication of the Memorial in October 2003.